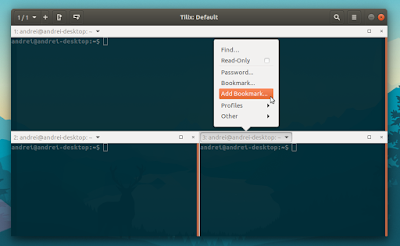 [Quick update] Terminix, a GTK3 tiling terminal emulator, has been renamed to Tilix due to some trademark issues. fixed crash when loading multiple sessions from file. Note that in my test, the Terminix settings weren't migrated to Tilix, so if you changed some of its settings, you'll need to do it again for Tilix. Update: to migrate your Terminix settings to Tilix, see the Migrating from Terminix section on the Tilix GitHub page. Also, if you use Tilix as a drop-down terminal, remember to change the command from "terminix --quake" to "tilix --quake". I updated the package in the WebUpd8 Terminix PPA to use the new Tilix name. To make sure those who have previously installed Terminix will receive an update with the new package, I added a transitional package, so updating using Update Manager, Synaptic, apt, and so on, should upgrade to Tilix 1.5.4. I will continue to use the ppa:webupd8team/terminix PPA for Tilix, because PPAs can't be renamed (besides the PPA title). I should also note that the PPA now provides Tilix packages for Ubuntu 17.04 (which has Terminix an old 1.4.2 version available in the official repositories). For installing Tilix in other Linux distributions, reporting bugs, etc. see its webpage.